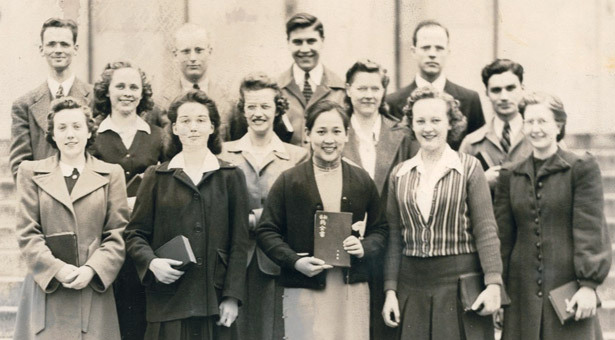 Can you identify the young female missionary pictured in the front row, third from the left? Though activism against human trafficking is fairly recent among Seattle Pacific University students, decades of Seattle Pacific students have dedicated themselves to God’s good news of freedom. The young female missionary pictured in the front row, third from the left, survived abandonment, imprisonment, and even a trek across the Himalayas to do so. Can you identify her — or better yet, all the members of this group? Hint: she was SPU’s 2007 Alumna of the Year. Send in your answers by August 15, 2015, and you will be entered into a drawing to win an SPU sweatshirt! Submit your answer below. Many readers wrote in to identify the peppy election rally for the 1967 Associated Students of Seattle Pacific election. John Pearson ’68 won the nomination for 1967–68 student body president by a very slim margin over Rick Ryding ’68 and Paul Fleischmann ’68, whose campaign signs are pictured here. Congratulations to them, and to contest winner Kathy Swanson Hoff ’67! Can you identify the young female missionary pictured above in the front row, third from the left? Send in your answer by August 15, 2015, to be entered into a drawing to win an SPU sweatshirt!